This is the application form for sponsorships for vehicles equipped with a manual transmission. For automatic transmission vehicles and sponsorships, use our Sponsorship Application for Automatic Vehicles. Products received for the sponsored vehicle must be kept in top condition and no other transmission company's products or identification may appear on said vehicle. All products supplied for the sponsored vehicle must be used solely for said vehicle and are not to be re-sold, transferred, held in storage or otherwise modified. Sponsorship includes product only. Other costs such as labor and sundries are the responsibility of the vehicle owner. Products must be on sponsored vehicle for no less than twelve months. Bowler Performance Transmissions logo placement must be maintained on the vehicle for this same period. The sponsored vehicle must display a minimum of two Bowler Performance Transmissions logos visible on the vehicle a minimum height of 3 inches. Bowler Performance Transmissions will supply the decals and/or Vinyl or eps files as requested. Bowler Performance Transmissions will also supply (2) shirts in the requested size(s) to wear at events, and in videos. Any other promotional or marketing materials you may need can be obtained by request and provided at no charge if Bowler Performance Transmissions deems them to be appropriate. Bowler Performance Transmissions retains detailed documentation files as evidence to support all sponsorships / product support. We require written follow-up summary reports that include photos of the vehicle at events, tear sheets of magazine feature stories, copies of ads/brochures/other promotional literature where the vehicle is featured, along with any other proof that demonstrates all elements of the sponsorship proposal have been fulfilled. Along with these physical submissions we request you create a vehicle profile on Car Buff Network www.carbuffnetwork.com this will allow us and our fellow enthusiasts to easily follow along with your build and generate more interest not only in our products, but also your abilities, and with any of the other company’s products you’re using. All proposals, photographs and information submitted shall become property of Bowler Performance Transmissions unless otherwise arranged. Bowler Performance Transmissions also requires that the owner of each sponsored vehicle complete a feedback form. 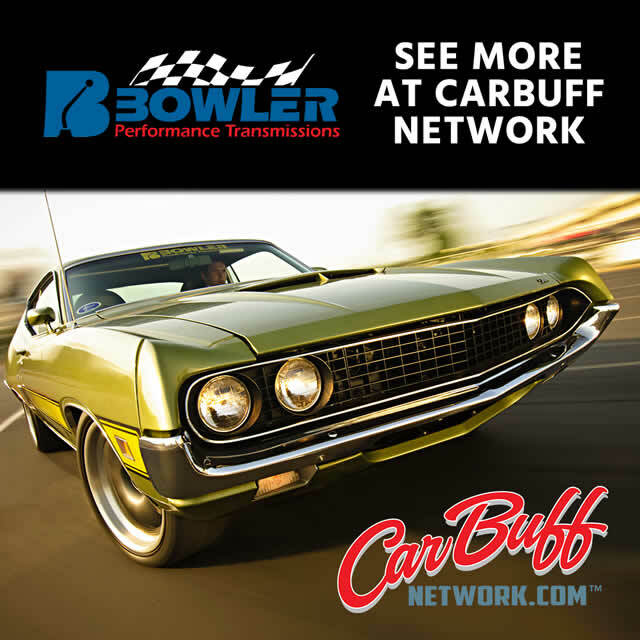 Any of this information can be used for advertisements, press releases, and promotions by Bowler Performance Transmissions. Reimbursement program: The sponsorship program is available to anyone who is interested in installing one of our complete transmission systems only. This can be a custom automatic or manual Tremec 5 or 6 speed conversion kit. Once we have reviewed and accepted your submission, we will offer you the requested products at our deepest dealer pricing along with the opportunity to receive up to $1,000.00 in contingency reimbursements. This will be presented to you in the form of an official estimate including the normal retail price along with our initial discount offered. If you accept our offer and provide payment we will then send you the requested product for installation. Once the product has been installed you can then apply for contingency reimbursements based on our reimbursement schedule provided below. No labor, installation, or other expenses incurred will be reimbursed. To request product reimbursement, you must be in good standings with Bowler Performance Transmissions, all of the sponsorship criteria must be met along with Bowler Performance Transmissions, company name, website or logo mentioned along with the products being used within 12 months from the date of the original sponsorship commitment. If you meet this requirement, please send a copy of your original sponsorship commitment form, a copy of your original invoice, all copies of media exposure with the company name and product mention to be reviewed. These submissions can be submitted once a month for up to 12 months after the sponsorship commitment has been established or until the maximum number of reimbursements has been met, whichever comes first. We are always looking for new and exciting ways to promote our brand. If you have an idea for promoting our products that is not listed in the payout schedule below submit your idea, we will review it, and if deemed appropriate we will establish a payout for your unique idea. The opportunities are endless! We recognize and value the commitment many of our customers give us. If you believe in what we’re doing and have a passion for spreading the word about how amazing we are to work with we want to reward you. For every confirmed transmission kit order we receive at a retail price level based on your referral you will get a check for $50. The customer ordering the kit must mention your referral and vehicle we sponsored to qualify. This reward is valid for up to 5 years after our sponsorship agreement and does not go against the $1,000.00 contingency program. Feature article in any major magazine publication. This must be a nationally distributed publication. “Tear out” of article must be submitted for reimbursement. Your vehicle on the cover of any major publication with Bowler Performance Transmissions in plain sight. Must submit “tear off’ of actual cover for reimbursement. Installation article of transmission kit we provided in any major publication. This must be a nationally distributed publication. “Tear out” of article must be submitted for reimbursement. TV show exposure. Must include mention of Bowler Performance Transmissions and visibility of company logo and / or website address. Must submit copy of video in hard format or email video file. Feature on TV show of product installation with mention that product was supplied by Bowler Performance Transmissions, visibility of company logo and/or website address. Bonus added if Bowler shirts are worn on show. . Must submit copy of video in hard format or email video file. $500 plus $25 for each individual wearing Bowler Transmission shirt. If shirts are needed we will provide them at no cost. Homemade videos. This can be a YouTube or Facebook submitted video made by you that features the products supplied with mention made to Bowler Performance Transmissions, our company logo visible, and/ or website address. . Must submit copy of video in hard format or email video file along with proof of how many views it has attained. This reimbursement is a one-time only payout. This allows you time to gain as many views as possible before submission. Major racing events: If you attend any of the major events around the country throughout the year examples: Midwest Muscle Car Challenge, Optima Ultimate Street Car events, Motorstate Challenge, Holley LS Fest, Ohio Musclecar Challenge or any of the GoodGuys auto cross events, and you place 1st-3rd in any event provide official race results along with any video or photos of your car participating with our company logo visible. Only one payout per event. What is Your Current Transmission? Prefer to Use Factory Shift Position if Possible? If Moved Back, How Far? Do We Need to Supply? Want to Upgrade to Hydraulic Clutch Linkage? Willing to Cut Tunnel for Fitment? If Racing (Autocross or Road Race) Would You Like to Upgrade the Transmission? I certify that I have read the "Bowler Performance Transmissions Sponsorship Policy" and understand the commitment required by both parties. Furthermore, I understand that if I do not fulfill my part of the agreement as outlined in the original proposal Bowler Performance Transmissions reserves the right to decline contingency payouts.